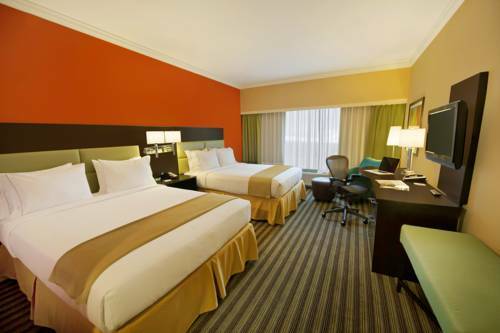 Welcome to the Holiday Inn Express in Princeton, New Jersey located just minutes from Princeton University and halfway between New York and Philadelphia. We are a 100% non-smoking facility. Our hotel is the perfect place to stay during your visit to the Princeton area with many restaurants, attractions and businesses nearby. Guests can enjoy the shopping at the Quaker Bridge Mall or Palmer Square, and Princeton University is a great spot for a stroll. With convenient access to Novo Nordisk, Bristol-Myers Squibb, Siemens, and Deloitte, our hotel is perfect for business travelers planning to attend events in Princeton. Our guests stay connected with our free wireless high-speed Internet access. Each morning we offer a Complimentary Express Start Breakfast featuring everyones favorite cinnamon rolls. And theres no need to leave the building to find lunch or dinner. Our hotel is connected to a 54,000 sq ft conference center with full-service amenities. Grab lunch at the Forrestal Grille or visit Flight, our wine and martini lounge to try a smart cocktail prepared with the freshest fruits and finest spirits. Theres no shortage of recreational activities either. Guests may enjoy a swim in our large heated, indoor lap pool, play a game in our indoor basketball court, or run along our scenic running trail. We look forward to welcoming you to Princeton! Enjoy the quiet and calm of our versatile meeting room overlooking the scenic lake and surrounding woods. Flexible meeting packages are available and the space can be set to accomodate up to 60 people. Children's program - Sesame Place is a theme park located in Langhorne, PA based on the TV show Sesame Street. The park includes rides, shows, and water attractions suited to young children. Semi private course in Mercer County. Hole by hole overview, the Bog restaurant, frequent player sign up and member tee times are featured. Six Flags Great Adventure is a 2200-acre park featuring awesome rides, great shows, and incredible attractions! With Hurricane Harbor and the Safari Ride next door, this will create a great experience for the whole family. Find impressive savings at Banana Republic, Brooks Brothers, Calvin Klein, Coach, Gap Outlet, J.Crew, Jones New York, Lucky Brand, Nautica, Nike, Polo Ralph Lauren, Reebok and more. There are over 70 outlets store at the Jackson Premium Outlets. The famous ivy-league Princeton University is located just a few minutes away. A beautiful campus to take a stroll. You can also visit the Art Museum and Library and really feel the University experience! Bring your family to the theme park where Sesame Street comes to life. Enjoy a summer vacation with rides, shows, and other family attractions. Centrally located in Monroe Township in Middlesex County, Forsgate Country Club is an exclusive, full-service, non-equity private Country Club that offers something for everyone. Golf outings, catering and select holidays are available to non-Members. Wild, exaggerated landscapes predominate in this vast indoor miniature train universe. The owner performs on a Phantom-of-the-Opera-style theater organ for atmosphere. A lonely pillar marks the spot where "the Lindbergh of Mexico" crashed and died in the New Jersey Pine Barrens. Marconi's east coast base of trans-Atlantic wireless communication is now a museum, "10 rooms filled with computer, radar, radio and ship wreck exhibits." Futuristic temporary buildings designed by architect Buckminster Fuller are behind the museum.